Note, Google Images already uses infinite scroll, and Yandex just rolled it out on yandex.ru last week. You can check out both properties to see how it works. You can also check out the YouTube video below to see one of Google’s tests in action. Google has also been testing a locked search bar (the header), which makes sense. Google will still want users to be able to refine their searches, even when viewing additional sets of results via infinite scroll. By implementing a locked header, the search bar would remain at the top of the page as you scroll down. It’s similar to freezing a row in Excel. The search box would always be accessible. It’s widely known in Search that many people won’t click through to page 2 or beyond. This has been highlighted in various studies, and I also documented this when analyzing the long tail of SEO. Instead of clicking through to page 2, many users would scan the top listings on page 1 and then refine their queries if they didn’t find what they needed. This obviously made ranking on page 1 extremely important, but also made targeting the long tail extremely important (as you would want to rank for long tail keywords that followed searches for head and torso terms). So, now that Google is testing infinite scroll, there are many questions about how this could impact organic search, paid search, local search, etc. Therefore, I spent some time taking a look at infinite scroll, with the goal of trying to determine its potential impact. Below, I’ll cover several ways that the Search results could be impacted by infinite scroll and what this means for companies trying to gain more exposure, clicks, and sales. Note, I did not cover every possible way that infinite scroll could affect the Search results. Instead, I focused on some core elements within each category of Search. Prior to infinite scroll, if you didn’t rank on page 1, you would need to rely on users clicking through to page 2 and beyond to see your listings. With infinite scroll, users might be more apt to simply click a “show more results” button to reveal another set of listings on the same page. If that’s the case, then rankings 11, 21, 31, etc. will become more important real estate-wise. Sure, they won’t be as strong as a true #1 ranking, but the first listing in a new set of results will give that listing more exposure than it gets now. In addition, this doesn’t just apply to rankings 21, 31, etc. The first few listings in each new set will increase in importance. We know via eye tracking studies that users tend to focus on the first few listings in the search results and then their focus fades as they scan down the listings. If you have content ranking high on page 2, those listings could very well gain more exposure when infinite scroll kicks in. When infinite scroll kicks in, users might be viewing many more listings per search session (versus just 10). 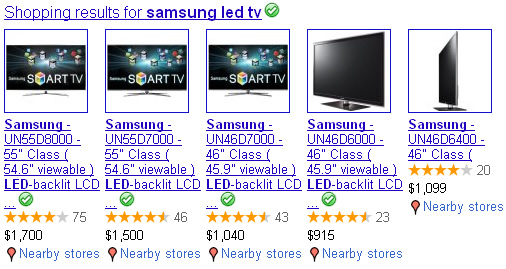 For example, if someone clicks the “show more results” button twice after searching, they will see 30 listings. This leads me to think that Universal Search will become even more important than it is now. If you’re not familiar with the concept of Universal Search, it’s the blending of various types of content in the SERPs. For example, video, images, news, blog posts, shopping, etc. Universal Search can help you stand out, since it often includes image thumbnails, whether that’s a video thumbnail, news thumbnail, product thumbnail, etc. With infinite scroll, users might be scanning 30 or 40 listings to find what they need. If you make sure that you target various types of content with a strong content generation strategy, you can have a greater chance at showing up within the blended results. And that can very well lead to more exposure and click-through. Similar to what I explained about Universal Search, rich snippets could become more important too. If you’re not familiar with rich snippets, you should start researching the topic today. The core engines have come together to support schema.org markup , which can provide more information about content across the web. For example, you can use markup on your site for articles, events, ratings, reviews, people, etc. Rich snippets enhance listings in the SERPs, and each snippet can look different based on the data at hand. When you break it down, the engines advocate using this additional markup, the snippets can help your listings stand out, and the markup is relatively easy to implement. Again, I recommend understanding how rich snippets work and then determine how your content can benefit from adding the necessary markup. You can see an example of a recipe rich snippet below. Although Google already provides additional paid search ads when users click through to page 2 and beyond, we know that many people don’t take the effort to actually venture beyond page 1. Since Google generates ~97% of its revenue from paid search, ad inventory is very important. With infinite scroll, I believe users will be more apt to load additional sets of search listings. If this is the case, then AdWords inventory will increase, which can help both paid search advertisers and Google. In addition, I believe the “new” ad space will be stronger for advertisers. The increased ad inventory can help both advertisers gain more exposure and clicks, while also helping Google increase revenue. It’s a win-win. Similar to what I explained about the organic listings, there will now be multiple top paid search rankings. If your paid search ads did not reach page 1 due to a lower Ad Rank, you now may have a greater shot at a top ranking (as users load additional results). We’ll have to see what the final implementation looks like for infinite scroll, but Yandex manipulates the page to jump the new set of listings to the top of the page. If that’s the case, the top paid search listings on load 2 and beyond will look very similar to what it looks like on page 1. And again, infinite scroll could increase the amount of time these ads show up, which can obviously impact impressions, clicks, and sales. Both ad formats and ad extensions in SEM will become even more important when infinite scroll rolls out. If a user is viewing additional sets of paid search listings, then having your ads stand out is very important. I see this already with my own clients when they effectively use ad sitelinks, location extensions, product listing ads, product extensions, etc. If you aren’t familiar with the various ad formats and ad extensions available to AdWords advertisers, then now is a good time to research them. For example, by using the range of ad extensions, your ads gain more real estate and provide additional visuals that can help your ads stand out, gain more credibility, and enhance click-through. And those are all good things in SEM. Similar to organic search, rankings #11, 21, 31, etc. will be additional #1 spots for local businesses. Obviously the first set will be more important, but 11 won’t be so bad either (if infinite scroll is used more than clicking to page 2). Place Search is critically important for local businesses. With infinite scroll, more places can be dynamically displayed, which can help even more local businesses gain much-needed exposure. In addition, if set up and managed correctly, the combination of paid search and place search could be extremely powerful for local businesses. As I explained earlier with paid search, there will be more ad inventory as users load more results using infinite scroll. Ensuring you have a solid local paid search strategy will be extremely important. Also, I mentioned ad extensions earlier in the post. Location extensions and call extensions can be a local business owner’s best friend. They enable advertisers to provide address information and a clickable phone number right in the search results. If more people use infinite scroll to view additional listings, Google could possibly add more Google+ related information in the right sidebar (along with ads and/or universal search elements). For example, if a user loads additional sets of listings via infinite scroll, Google could decide to provide social recommendations in the right sidebar that drive users to Google+ (to either sign up or to interact with other users and organizations). We’ve seen the tests, we’ve seen it in action on Google Images, and now Yandex has rolled it out. In my opinion, infinite scroll is coming soon to a SERP near you. I hope my post explained the potential impact that infinite scroll could have on organic, paid, local, and social search. Let’s face it, if Google can enhance usability, increase ad inventory, gain more clicks for advertisers, while also increasing revenue and profitability, why wouldn’t it implement infinite scroll? Now the ball is in your court. I recommend reviewing your digital marketing efforts to make sure you’re ready for infinite scroll.